The rebellion of 1745. On the 8th of November 1745, A Scottish army crossed the river Esk just north of Longtown, near Riddings farm, led by Charles Edward Stuart eldest son of James 3rd of England and 8th of Scotland, who was in exile in Rome, Prince Charles or Bonnie Prince Charlie as he was known to his followers, was crossing into England to reclaim his fathers throne from the Hanovarion king George the 2nd who ruled England and Scotland at that time. Charles stayed at Riddings farm as a guest of David Murray overnight, where in the morning Mr Murray presented the Prince a bag of gold and ten horses, the Prince in turn gave a gold ring to each of his daughters (I wonder if any of these rings are still in the Murray family today?). Moving down through Longtown he met with the 2nd part of his Army which had come down through Lockerbie with the cannons and wagons of supplies, crossing the Eden near Rockcliffe, the Army marched on Carlisle which in those days was still a walled garrison city, with a garrison of soldiers to defend the castle. The Scottish Army then surrounded the city and began digging siege works in which they would place their cannon to bombard the city walls, while this was going on the army sent out roving parties to look for food and supplies in the local area, one such party rode to Rose castle the home of the Bishop of Carlisle, led by Captain Donald Macdonald, outside the castle doors a servant stopped them and explained that inside the bishop’s daughter had given birth to a baby girl and was being Christened, Captain Macdonald then said they would wait outside till the ceremony was complete, he took the white cockade from his hat (a fan shaped piece of material placed in the hats of the supporters of bonnie prince Charlie), giving it to the servant to present to the child, this was done, then the highlanders where presented with beef, cheese and ale to celebrate the child’s Christening, the party then left the castle unharmed, the baby was named Rosemary and became Lady Clerk, 77 years later she was presented to the prince regent in Edinburgh, where she wore the same cockade. Outside the city Charles heard that a government army commanded by field Marshall Wade was advancing toward Carlisle from Newcastle so leaving part of his army to keep a watch on Carlisle he marched to Brampton to meet Wade’s army in battle. The local people hearing of the army coming to Brampton, and believing the stories of highlanders eating children hid their children in a secluded place near Nether Denton till the army had gone; the farmers also hid their cattle in the woods to avoid theft. 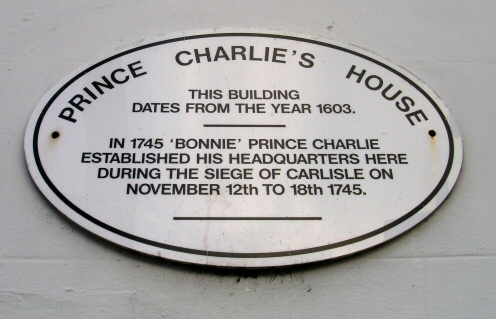 Prince Charles stayed at the Joiners arms (Now Alexander’s shoe shop) for several days, till the news reached him that Wade had turned back to Newcastle being stopped outside Hexham because of the snow, when news also reached Carlisle the city including the garrison decided to surrender, on the 16th of November John Backhouse (the city mayor) rode to Brampton to hand the keys of the city to Prince Charles. On the 18th Charles rode into Carlisle on a white horse followed by 100 pipers with the cannons firing a salute and the church bells ringing, following the good behaviour of the army the citizens of Carlisle came out with free beer for the highlanders. Four days later Charles set off south to march on London. As they marched south the Hanoverian supporters put out a false story that the highlanders would kill all men and children and ravish all the women, one night a elderly lady had 4 officers billeted with her after feeding them with food and drink she turned to the officers and said “now that you have fed I suppose you now do some ravishing”, unfortunately she was left disappointed. The prince’s army reached Derby but turned back due to 3 government armies marching to intercept them, reaching Carlisle on the 19th of December. Leaving a small garrison of 400 soldiers to hold the city the army crossed the river Esk which was in flood loosing 3 women washed away to drown. The highlanders then danced themselves dry to the sound of the pipers playing. A story handed down in Longtown is that a highlander too wounded to cross the river (the bridge was not yet built) was given shelter by a young lady in one of the houses in Swan street and hid in the loft when the government soldiers came looking for any rebels hiding in the area, later on this young man married his rescuer. Meanwhile back in Carlisle the city was now surrounded by the king’s army under command of his brother the Duke of Cumberland, the Duke was angry with the citizens of the city who he had thought surrendered too easily to the prince, indeed he was all for levelling Carlisle with his cannon brought up from Whitehaven with all the citizens inside. But after several cannon shots which quickly damaged the city walls the highland garrison surrendered, it was not a nice end for them, kept prisoner in the cathedral without food and water 8 of them died, then transported to Lancaster castle eighty more of them died of eating poisoned offal, the survivors were then tried and convicted of treason and were either hanged or transported abroad. As for the citizens of Carlisle they were harshly treated by the soldiers the leading citizens were arrested, one citizen a major Farrer who had surrendered with the city, was attacked by soldiers and robbed taking £300 worth of goods and taking 140 cartloads of hay from his barn. Carlisle has a unique place in English history being the last city to be besieged by land. Many of these stories and more you will find in a rather good book called “The ,45” by Christopher Duffy.